One of my favorite publishers in the Christian genre is Lighthouse Trails Research and Publishing. Besides the excellent books available, they also have a sister company called The Shepherd’s Garden that includes an exclusive line of certified organic tea that is the best I’ve tasted – and perfect to enjoy with a good book which is why I’m including a review of them at this book blog! The Cranberry Orange Rooibos is my favorite but the Vanilla Almond Rooibos is a close second. Other flavors include Chai Green, Peppermint, Peach White, and Spicy Red Chai that can be purchased separately (20 teabags per box for $6.95) or you can try a sampler box that includes an assortment of all the flavors. Each individually-wrapped teabag has a Bible verse on the tag that adds a lovely note of encouragement to an already enjoyable experience. 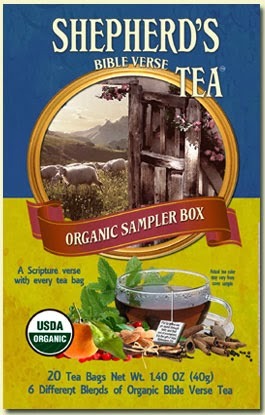 Shepherd’s Organic Bible VerseTea is Here! Dec 3rd, 2010 Posted in new releases, Shepherd's Organic Bible Verse Tea | Comments Off on Shepherd’s Organic Bible VerseTea is Here! We are happy to let you know that the Shepherd’s Tea has finally finished production and has arrived at the Lighthouse Trails facilities. First of all, we want to let those who have already ordered the tea and have been waiting know that ALL backorders have shipped from Lighthouse Trails in Montana on Thursday, December 2nd. We thank you for your patience during this time when several unexpected start-up production delays prolonged this process. For those of you who are unaware of this new division of Lighthouse Trails,this summer we announced the beginning of The Shepherd’s Garden. In a follow up notice, we explained that this would be a “tent-making” effort to help support the ministry at Lighthouse Trails. The product line is blends of organic Bible Verse tea. Each bag of tea (in a box of 20) has a tag with a KJV Bible verse on it. Thank you again for your patience; we hope that the Shepherd’s Tea will be a blessing to our Lighthouse Trails readers and will help point many people to the wonderful and enduring Word of God.